Perhaps surprisingly, my father's memoir Heimlich's Maneuvers, recently published by Prometheus Books, hasn't been getting many reviews. But today the American Spectator, a conservative political magazine, published a lengthy, glowing review. Perhaps more surprising, the reviewer swallowed and repeated a string of my father's lies about the war in Vietnam. (Dr. Heimlich) saved the lives of thousands of soldiers with another invention you probably never heard of -- the Heimlich valve. ...The Heimlich Valve became standard equipment in every soldier’s pack in Vietnam and saved tens of thousands of lives. Then when Dr. Heimlich visited Vietnam in 1999 he was astonished to find everybody knew his name. It turned out the Quakers had supplied North Vietnam with Heimlich Valves and it had saved thousands on that side as well. It was the most emotional experience of his life. 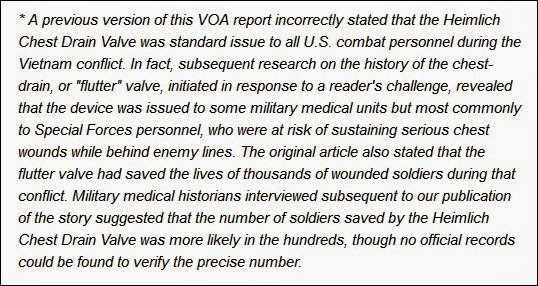 Judging by the above bio, I'm surprised that a veteran reporter would fall for the absurd claim that the valve was carried by every soldier who fought in Vietnam. Finally, per my recent item, My letter today requesting Prometheus Books to retract my father's "gross distortion of Vietnamese and U.S. history," my father's bizarre claim that the Quakers (the American Friends Services Committee) supplied Heimlich Chest Drain Valves to North Vietnam was thoroughly debunked in Radar Magazine eight years ago. Presumably a flag-waving magazine like the American Spectator and Mr. Tucker are interested in accurately representing U.S. military history, so I'm sending them this item and inviting them to comment for a follow-up. The good doctor is now 94 and living in an assisted facility in Cincinnati....Heimlich ends his book with this sentence: "I'm not done yet." Nor should America be done with honoring this peerless pioneer. I suggest President Obama make plans right now for awarding him the Presidential Medal of Freedom. It’s hard to think of anyone who deserves it more. For starters, how about someone who doesn't make up self-aggrandizing lies about U.S. and Vietnamese history?